... with my friend, Julie. when I invited her to retreat with me. Since then, we've had some great times. but I always have mine with me, too. Now she has pictures of herself. I put this together for her birthday. "Mooooooo" ... or is it "Sueeeeee?" she tripped and fell on the cement steps. Can you just say "ouch!?!" Look at the black and blue chin. It's holding a secret picture that's hiding under Julie's picture. Can't share it here but wanted to make sure Julie never forgets! It was a chilly day but that sunshine was so inviting! We ate our lunch at the picnic table and caught some of those rays. and lots of food was eaten. Oh boy ... what a weekend! We certainly had a wonderful time. he/she will say, "SAY CHEESE." Nope - not this time. Do you remember what was said? No, the cow wasn't up on the porch as Julie ate her breakfast. But it wasn't very far away. Julie made for her granddaughter. AND ... it took first place in the Texas State Fair. It's moments like this that make retreating so much fun. Tell us something about yourself. I have lived in Pennsylvania, Ohio, Texas, Kentucky, back to Ohio, New Mexico and back to Texas where I hope to live forever and ever. Amen. I am married (22.75 years) to The Runner. I have two adult children – a daughter in Illinois and a son in Ohio. I love to read murder mysteries. I volunteer a lot with the fire department but not in the putting out fires capacity. I love to dance. I am extremely organized and know where everything is at any given moment. I don’t especially like to talk on the phone. I detest mushrooms – it’s a texture thing. I only have one sibling. I am scared to death to fly. I do not like the cold. I used to be addicted to Pepsi but haven’t had one in nearly 40 years. We go to bed early and get up early. I was fortunate enough to tour the USS Ronald Reagan. I can talk like Donald Duck – and sing and sneeze like him, too! I don't like to drive. I almost always have on nail polish but often it’s chipped! I love sunshine. I was once attacked by a goose. I was a majorette in junior and senior high school. I was in the concert band and the clarinet was my instrument of chance, however, I never played one. single. note. I used the same reed for six years – and I still have it! I just barely meet the height requirement for not riding in a booster seat. Now that we know a little about about you, tell us how others would describe you – in just five words. This is difficult! Hopefully, they will say that I am loyal, trustworthy, upbeat, crafty and fun(ny). How did you find out about Whitworth Ranch Retreat? I entered a drawing but don’t remember doing so. One day Stacy called me to tell me that I won a weekend for myself and three friends. OMGoodness. Off the top of my head I didn’t even know three friends that crafted but after digging through my brain cobwebs, I was able to find three. Then Stacy called me back to say that the other winner never returned her phone calls and I could bring nine friends. Now what? I was able to scrounge up eight people – and some of them I had never met. As the old saying goes ... I’ve never met a stranger. Once you sit in a room with people for three days, they’re now your friends. The retreat was from January 11-13, 2013. I’ve not looked back since!!! How many times have you been there? Gosh – I think 13 or 15 times. Is this excessive? Yeah, I didn’t think you’d think so. Haha. Do you have a preference as to which room you sleep in? Yes, I do ... I prefer the blue and yellow room just off the kitchen in the craft building. I even have a favorite bed!!! Where do you prefer to get your craft on? Large room, small room? Do you have a favorite spot/table? 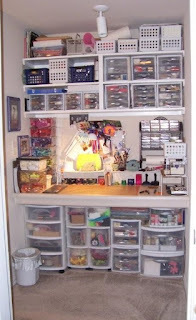 I’ve crafted in both, but my preference is to be in the smaller craft room – in the corner just behind the door. Were you in a mixed group or did you fill the house with your own friends? I have always been in a mixed group and wouldn’t have it any other way. You just can’t believe how many new friends I’ve made that way. If there is an opening for just one person, are you open to attending a retreat with women you’ve never met? Absolutely! They’re only strangers for the first hour. We all know that Stacy is an excellent chef. Do you have a favorite meal? I’m pretty partial to her Bolognese spaghetti – the sauce that she cooks for 18 hours. It’s good ... paired up with green beans and broccoli. Now you’re making me hungry. What do you do in your spare time when you are not crafting or retreating? I love to read who-done-it books, volunteer with the fire department, walk and blog hop. Are you a paper crafter, seamstress, quilter, knitter, jewelry maker or trouble-maker? Wow – that’s a loaded question. I’ll take you back a few years. When I was pregnant with my daughter I fancied myself as a seamstress. Bought myself a sewing machine, took a class or two and made maternity dresses. Then along came baby, the thread kept breaking on my machine and that’s when I decided this wasn’t for me. After moving the machine from closet to closet and then from house to house, I finally took it to a thrift store. I wouldn’t mind having a machine now – not for fabric but for paper. 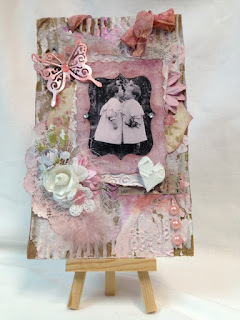 I used to decoupage – with polyurethane, not Mod Podge. I would sand between each layer until the image was completely embedded and there was no “step” – rubbing your hand across the product was like feeling glass. My parents had several of my pieces hung in their homes for years! Actually, just about everything I ever made and sent to them ended up on their dining room table – it was like a shrine. Everybody in the family wore one of my macrame belts and had plant hangers. I even taught sixth graders where my children went to school how to tie knots. 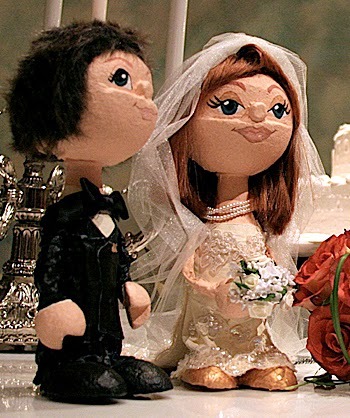 Anybody ever hear of Dip ‘N Drape dolls? That was a fun craft back in the ‘70s. All that was needed was a piece of Dip ‘N Drape. I dipped it in water and then placed it on fabric and then “draped” it over a cone-shaped Styrofoam. A little pinch here, a little pinch there and the outfit was created (MUCH easier than sewing!) The part I loved the most was painting the face, which was made out of a Styrofoam ball draped in the same material. It was so much fun watching them come to life. I made a nun, a couple of brides and lots of boy and girl dolls. I don’t have any pictures of the ones I made but to give you an idea, here’s something I found on-line. I went through a crochet phase. But I only crocheted afghans and coat hangers. I don’t remember how to make an afghan but I still crochet coat hangers. My shoulders aren't very big and regular wire hangers make little pokey marks in my shirts; yarn around the hangers prevents that! I’ve not dabbled in jewelry making – I don’t wear that much but oh, those beads call my name!!! I do use them on cards and mini albums though! My first love is paper crafting. The possibilities are endless. I don’t consider myself a scrapbooker per se but I use all the techniques and use all the same products as a scrapbooker does. I’ve done so much with it over the years. I’ve covered books, clip boards, gift bags, letters, coat hangers, candles, door hangers, frames, recipe boxes, shadowboxes, bottles and cans and jars, journals, birdhouses, candy bars, shoes, tags, furniture, binder clips, canvasses, clothespins, bulletin boards, ornaments, picnic baskets and of course cards. Since my focus is on paper crafting and card making, the majority of what I talk about will be about that. And the last thing in that question asked if I am a trouble maker. What? Who? Me? Never! How long have you been playing with paper? My parents celebrated their 60th anniversary and I had seen where people put together a scrapbook for anniversary gifts. I wanted them to have one of those! I contacted relatives, people my parents went to high school with, their former co-workers, former and present neighbors and asked them to send me a card or letter for them - with a little memory of them written in the card. Once I had everything I needed to put inside this album, I had no idea what to do with it. After many trips to the craft store, I still had no idea what to do. I asked complete strangers in the scrapbook aisle questions like “what’s that for?” and “how do you do that?” and on and on. I still laugh when I think of how I matted a picture. Instead of just putting the picture on a piece of cardstock and calling it matted, I actually CUT A FRAME and put the picture inside the frame. There will be no pictures of that album ... I’m too ashamed. But, the bottom line is that my parents loved it and I think they both looked through everything and read every card and note a gazillion times. Card making – what I am most passionate about. Over the years, I have made approximately 7,000 cards. The best part? I never duplicate. EVER. Here are a few that still make me smile. This card is just feathers and flowers - no image. Rarely do I create cards like this any more and I'm not sure why because I do like the way it turned out. I used lots and lots of products as well as a photograph of my great grandmother on this card for my cousin's birthday. I later learned that she framed it! The focal point on this particular card is the sentiment. This went to The Runner's friend that is facing some serious health issues. I pulled an image off the computer and used on this card and added lots and lots of layers and flowers. The making of cards started with a simple gesture. My friend, Pat, invited me to her home for the weekend. She was involved in the Red Hat Society and wanted me to come to a RHS luncheon and fashion show. As a small thank you gift, I made a half a dozen cards using bits and pieces left over from the anniversary album. She said that I “had what it took” and encouraged me to keep on going. To this day, she’s one of my biggest cheerleaders. What is your signature style? That has transpired through the years – as it should. Once I figured out how to use all the products I was rapidly accumulating, I learned how to do some of the techniques. I made my daughter a HUGE album for her retirement from the Navy. Before giving it to her, I showed a friend and she said it was “shabby chic” ... I had never heard of that expression before, but now that I know what it means, I think she was right. What are you working on right now? Cards. What else? Shortly I will be on a big push creating Christmas cards. How would you describe your art for the general public audience if they have never seen it before? I love to distress and I love to use vintage-y items. Lace, glass beads, tags, glitter, flowers – lots of flowers, stenciling, sequins and feathers grace the majority of my cards. How does your work differ from others in your genre? Maybe my attention to detail. I never think a card has enough on it ... rarely (if ever) do I create a plain Jane card. What have you created that you are most proud of – and why? Three things. I created a canvas for my father with his mother and his grandparents’ picture that was taken in 1903. I researched the family history and that went on the back of the canvas. I did the same thing for my mother. The picture on her canvas was of her parents on their wedding day in 1907. They cherished those pieces until the day they died. The other was the (not-so) mini album I created for my daughter. Not only did I have photos, but I researched and journaled all about the duty stations she was at during her 20-year tenure with the Navy. What do you wish you were better at? I would love to become more proficient in multi-media art. I would also love to learn how to crochet itty-bitty flowers that aren't too thick so that I could use them on my cards and mini albums. If Ms. Muse decides not to show up, where do you get your inspiration? I find that a giant dose of craft supplies shopping helps me a lot. There’s nothing like new product in the house to get back in the groove. How do you stay inspired? I try to keep in mind that people like what I do and I want to do something nice for them. Does that make sense? How does your creative process work? Let’s say I am making a card. I try to visualize what a person likes: what is their favorite color – muted or bright, are they flower lovers, do they like birds, do they appreciate vintage or modern or are they “outdoors-y?” About a year ago I started using images on my cards as a focal point. I search for the perfect image and then choose coordinating colors. Once I “go shopping” in my way-too-large stash, I pull everything out and work on placement. Once I am happy with that, I get glue happy. Do you have a dedicated craft area in your home? Yep – the whole place is dedicated in one fashion or another as MINE. Fortunately, everything is contained! The walk-in closet for my clothes has all of the Christmas supplies on the top shelf. The shoe shelves have no shoes ... just projects that I’ll “one day get to” and there are two towers of plastic drawers with supplies. The dining room table is rarely used for dining. This is where my “photo studio” is located. The lighting is great in here so why not, right? The table is also where I store the completed cards until it’s time to put them in the mail or deliver. The short hallway from the living room to the guest bedroom and guest bathroom has an alcove where I actually create my magic. THIS is my playground! The counter is five feet long by three feet deep. Above the counter are three shelves and under the counter is where I have TONS of plastic containers. This started out as being my only area for storing supplies but I outgrew it. I was spending a lot of time “shopping” on the floor. I would pull things out that I thought would work on a project and sit down and work on placement. That got old real quick! The Runner bought me a table. It sits behind me when I sit at the computer, which is in the office. As my sister says “this is where you shop and the playground is where you work your magic” ... and she’s right. Under the table are some pizza boxes with foam and specialty papers. I also have three large plastic boxes that house all the fabric flowers I’ve made. The store-bought flowers are in six shoe-box-size plastic boxes. Don't judge!!!! I also have seven plastic containers where I store my coffee filter flowers. There’s also a divided box where I keep my already-made embroidery floss flowers. Then there’s four plastic boxes where I keep the embroidery floss that haven’t been made into flowers yet. Next to the table is a steamer trunk. On top of that are three plastic milk crates where I keep my paper pads. Now what did I tell you about judging????? Next to the trunk are two very large plastic boxes (I love The Container Store!!!) full of fabric just waiting to be turned into beautiful rolled flowers. At this point, I find that it’s easier to make flowers as I need them – I’ve outgrown the boxes under the table. How do you keep your area organized? I think my parents missed the mark and gave me the wrong middle name ... it should be ORGANIZED because I am. To a fault, perhaps. Plastic containers are wonderful. What’s important is to make sure you have the size that best fits the need. It’s crazy when everything is just jammed into a container and you have to dig for what you need – and everything ends up falling out. A digger I am not! I’ve started out with one size container and moved up and up and up. The containers don’t go to waste because there’s always a new product ready to take its place. The majority of my crafting is card making. I do create mini albums, too. Once I finish with a card or even just one page to the album, EVERYTHING goes back to where it belongs. Every. Single. Time. It’s non-productive to have to search for those scissors or that spool of ribbon. When I stop for the day, I clean up everything as well. If I don’t – and yes, there ARE some times where I don’t clean up after myself – then I don’t feel like getting back at it. I think that’s the ticket to organization ... put stuff away. A place for everything and everything in its place. My mantra. Over the years, I've created many mini albums. It was too difficult to choose just one cover; here are three of my favorites. How many hours a week do you spend in your happy place? Gosh – I’ve never timed it, but I will say that I “work” almost all day, almost every day. I might not actually be gluing and making cards though. Some times I’m shopping, organizing or just making flowers. I also spend a lot (!! too much !!) of time on the computer. What would the walls in your craft space say? About you? About your work? Hmmmmmmmm ... that’s another loaded question. I would hope the walls would say that I am dedicated to what I do. About my work? Meticulous with a great sense of attention to detail, I think. If you could add just one tool to your craft arsenal, what would you add? Gosh – don’t I already have everything? Maybe a new die cutting machine. When my 10-year old Cuttlebug fails to serve me. I've got my sights on the new Big Shot ... we'll see. What is your favorite “must have” item for crafting – something that you just cannot be separated from? FLOWERS. What is the most useless item that you have purchased to craft? I don’t even know what you call it, but I had to have it ... are you judging me again? 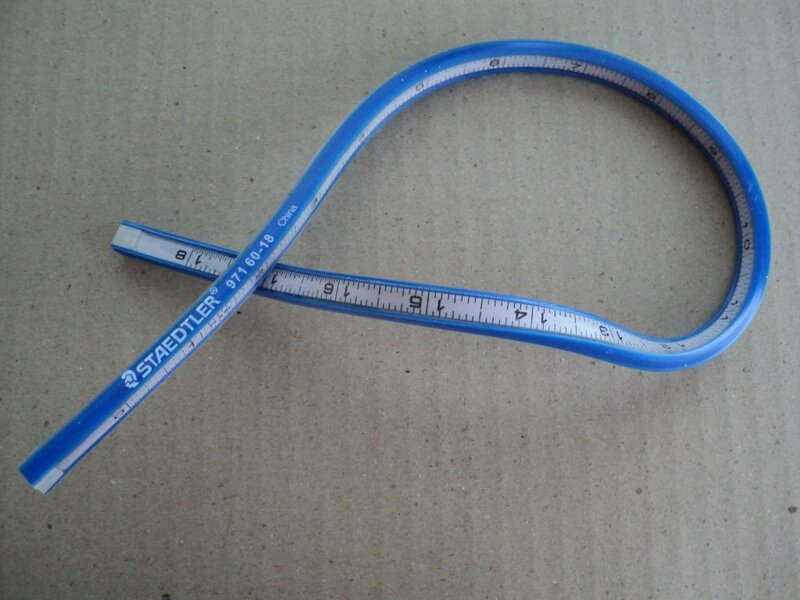 It’s something like a ruler but it bends. I’ve not used it one time but I still have it. Haha. There’s hope, right? If anybody reading this know what this tool is - or more importantly, how to use it, please let me know. Do you keep any of your own creations on display? If you mean in my “craft room” which I don’t have, then the answer is “no” ... but I have made some items for our home that are hung on walls or sitting on shelves. A couple of years ago I made these three canvasses that hang in our dining room. Pretty simple and works perfectly on a bare wall. So far, I’ve not tired of them. The hat boxes on the table are more of my creations. What are your tricks for organizing your supplies? Keep like items together if at all possible. I have all of my brads and eyelets in little divided containers I bought at Hobby Lobby. I keep them organized by color. Also, I keep all of my ribbons in 12 empty plastic cookie containers from Sam’s. Hey – I needed the containers but the cookies were pretty good, too. These, too, are organized by color. They are sitting on a shelf on a bookshelf in the office. I have almost as many of those containers behind doors in the same bookshelf. Those house my larger flowers. Again, organization has got to start with being tidy. There’s no sense in having a container for everything if your “everything” isn’t in the container. Finish this sentence: When I am in my creative space, I am focused. I am going to grant you three wishes to make your area into your dream space. What are your three wishes? Not gonna lie here ... I want a dedicated room. With proper lighting. And cute storage containers. And bells. And whistles. What are your favorite products to create with at this moment? Tags, seed beads, flowers, stencils, molding paste and glitter. How long does it typically take you to finish a project? Start to finish, the majority of my cards take between two and three hours. Are you a neat or a messy crafter? When I am actually working on something, I’m somewhat messy but once I’m finished, I put everything away and leave no footprints. It’s time to go shopping. Does most of your money go to Hobby Lobby, Joann’s, Michael’s, conventions or a local scrapbook store? Or are you an on-line shopper? Oh I spread it around! Trust me on this one. Joann’s probably gets the least of my money and I’m not sure if it’s because of location or their inventory. One thing that I don’t like is that their prices aren’t clearly marked. Hobby Lobby is walking distance (if you’re energetic!) so I shop there often but I prefer Michael’s because they’ll honor competitor’s coupons and they offer 50 percent off coupons frequently. (Rarely do I purchase anything unless I have a coupon!!) I go to at least three conventions a year and always bring home lots and lots of goodies. There aren’t any large local scrapbook stores that are nearby – as in five miles. I was so sad when The Scrapbook Pad and Recollections closed as they were my “go-to” happy place and got the majority of my money. Rarely, if ever, do I shop on-line. I like to use coupons and not pay shipping charges. Are you an impulse craft supplies shopper? If it’s flowers, ummmm, yes. I can’t get enough of them. Other than that, I have to say that I am typically not an impulse shopper. Do you have any personal goals you have not yet attained? If so, what are you doing to fulfill these goals? Personal goals? Well, like every woman in the world, I guess lose weight. I’ve not had a piece of chocolate since August 31, 2014 ... and yes, that’s helped. My sister gave me a Fitbit and I've been walking every morning - even in the Texas heat - and that's helped, too. Tell me that one thing that you have not yet done that you really want to do. 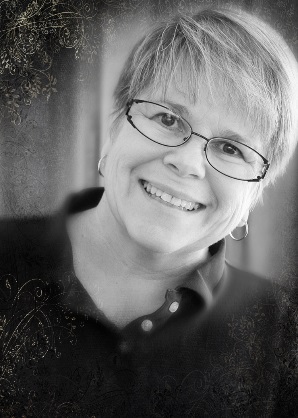 I want to meet Vicki Boster. She’s my friend in Kentucky ... you know – “the nest lady.” I would love to meet her! If you were given $1000 to spend on craft supplies/tools what would you purchase? You know how difficult it is to shop for someone that has everything? Well, that’s me. There’s nothing that I am just dying to have. And, if you’ve shopped for supplies/tools, you know that a grand doesn’t go real far. Since the money is going to be given to me, I’d spring for a Vagabond (to sit next to my new Big Shot.) I’m getting low on some of my hard molding paste by Golden so that’ll go on my list. I would love to get my hands on some 7 Dots papers and supplies – wish they sold them here in the states! There are a few Cherry Lynn Design dies that I’d like. Oh yeah, if there’s any money left over – FLOWERS. Realistically, I know that money isn’t going to fall into my lap so if you’re looking for some gift ideas, here they are! Haha. Do you spend hours and hours looking at blogs? Do you have a blog? Oh my goodness yes ... I love reading blogs!!!!! I spend way too much time gazing at them but I’ve learned so much and have ‘met’ so many wonderful people so I can justify that time. This is my blog – one I started so that I could help create awareness for Whitworth Ranch Retreat and talk about retreating. I also have a personal blog that I would love for you to visit: suzeqcreations.blogspot.com. What is the best piece of advice that anyone has ever given you regarding your crafting. There’s no such thing as a mistake. If something didn’t turn out the way you expected, it’s just an opportunity to work around it – or cover it with a flower!!! Worse case scenario? Throw it away and start all over. It’s ONLY paper! I've messed up a few projects and have always been pleasantly surprised at the "fix." Also, remember that there are no rules in crafting - just go with the flow. Do you have any inspirational words to share? Do what makes you happy. If you’re happy just buying product and hoarding it, then do it. If it makes you happy to put photos in a scrapbook and journal all around them, then do it. If it makes you happy to make stuff for other people, then do it. Just do what makes YOU happy. When it’s not fun any more, then don’t do it. I know. I know. What happens at the retreat stays at the retreat. Let’s break a few rules. Tell me something interesting that was said or happened on one of your retreats. Oh no – I’ve been there too many times and have seen a lot of stuff. My lips are sealed. No dirt coming from me. I have been following Karla's blog for years and years and years. I finally had the privilege of meeting her in April. See for yourself - she's delightful and oh, so talented! with the people who are important in your life. How did you find out about Whitworth Ranch Retreat? Once, but that isn't enough. Do you have a preference as to which room you sleep in? Where do you prefer to get your craft on? Do you have a favorite spot/table? I only used the large room, and loved it. or did you fill the house with your own friends? family and new friends from that weekend. with women you’ve never met? to meet like minded, creative people, so yes. We all know that Stacy is an excellent chef. when you are not crafting or retreating? Baking, gardening, playing with my grand fairies. but I really enjoy the rest, especially trouble. and just finished a fairy tale one. if they have never seen it before? What have you created that you are most proud of – and why? and stamina for working that big. Has any of your work ever been published? If so what and which publication? Daphne's Diary, and Country Sampler Home Tours: http://www.karlascottage.com/articles.htmTours: . Do you have any crafting secrets you would like to share? Always use the best materials you can. Your time is worth the best. Do not hoard your supplies. I love a walk through an antique mall or flea market. Some little tidbit will usually inspire a new creation. Spending time with creative friends, online or in person. 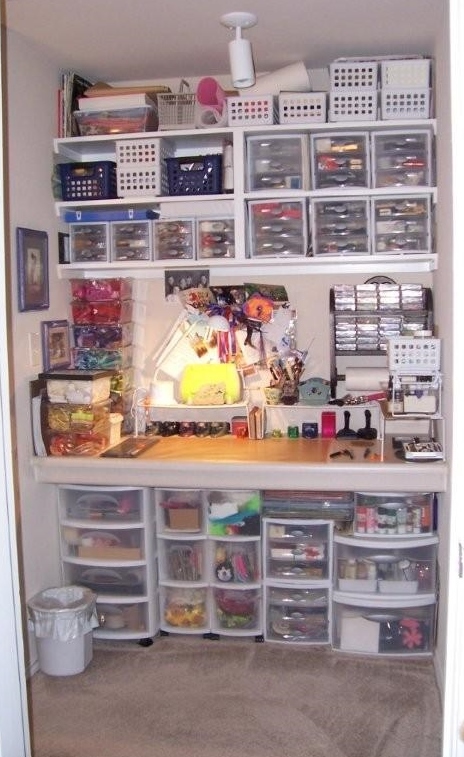 Do you have a dedicated craft area in your home? My studio is in an addition to our 100 year old farmhouse. Tell us all about your studio. boxes, and stack of my supplies. How do you keep your area organized? it would be hard for me to keep it presentable. until I have about a 6" square of desk space left to create in. also makes me stay focussed and organized. as I keeping working on one project after another. How many hours a week do you spend in your happy place? What would the walls in your craft space say? Oh no, she is squeezing in more stuff? My walls are aching already!!! We don't have room for another table full of junk!! and it has made me pretty happy. What is your favorite “must have” item for crafting. something that you just cannot be separated from? that you have purchased to craft? Glue sticks - after a few years, the glue falls apart. Do you keep any of your own creations on display? I often create things just for certain spots on my walls. or the things that no one bought when I did try. and soon becomes a storage problem? What are your tricks for organizing your supplies? or keep things where I can see them. Out of sight, out of mind, I lose what I can't see. lose track of time and get in trouble for making dinner late. to make your area into your dream space. I have my dream space!! to create with at this moment? How long does it typically take you to finish a project? Are you a neat or a messy crafter? Pretty neat with the work, but my area messes up fast. conventions or a local scrapbook store? Or are you an on-line shopper? Do you have any personal goals you have not yet attained? If so, what are you doing to fulfill these goals? I'm not a goal oriented person. that you have not yet done that you really want to do. I'm usually pretty happy in the moment. on craft supplies/tools what would you purchase? and pay for my sisters to come with me. Do you spend hours and hours looking at blogs? If so, tell me all about it. and supplies to make your own art. I also teach classes and adore making kits. are very enjoyable for me. Thank you, Karla, for your allowing us to get to know you more. Remember one thing: You Matter. I'm back again with another featured guest. Grab yourself something cold to drink and meet Dodie. at a school just one mile from my house. and a grandmother to Oliver. I've been married for 36 years to the best guy in the world. how would others describe you in just five words. Funny, loyal, rule-follower, kind, creative. How did you find out about Whitworth Ranch Retreat? My sister, Sue. How many times have you been there? Once. Next time, I would like to be in the upstairs bedroom in the craft building. Where do you prefer to get your craft on? Large room, small room? Were you in a mixed group or did you fill the house with your own friends? in fact, the only person I knew before I went was my sister. I did, however, make a lot of new friends. What do you do in your spare time when you are not crafting or retreating? Are you a paper crafter, quilter, knitter, jewelry maker or trouble-maker? Paper crafter, digital scrapper, counted cross-stitcher, and photographer. at Teachers Pay Teachers: https://www.teacherspayteachers.com/Store/Dodie-Pajer. it was easiest to take and work on digital projects. I got a LOT accomplished! How long have you been crafting? At least 30 years. What made you start crafting? It’s in my blood; I couldn’t help it. When you create something, do you sell, gift or keep? I’ve done all, but probably gift is what I do most. What is your signature style? Eclectic – I like it all! Learning how to use my new Cricut Explore Air. What have you created that you are most proud of and why? most of which I am proud of. that I created for a friend’s birthday because it’s soft and pretty. Keeping my craft area tidy as well as managing my time better. If Ms. Muse decides not to show up, where do you get your inspiration? I go onto websites to see what’s happening. Tell us all about it: what have you done to make your space cozy or beautiful or inspiring? How do you keep your area organized? My craft space is in my laundry room. as well as another counter behind me. How many hours a week do you spend in your happy place? Not enough! What would the walls in your craft space say about you? Gee, she needs to be here more often. What would the walls in your craft space say about your work? We are so happy to show off what she does. If you could add just one tool to your craft arsenal, what would you add? Whatever the newest item that I have just acquired. What is the most useless item that you have purchased to craft? but that’s because I haven’t spent any time trying to learn how to use it. and other creations on walls or windowsills. In fact, I spend time on the web trying to get ideas. and tell myself that I do good work. 3.) a better way to organize my growing stash of dies and stamps. What are your favorite products to create with at this moment? My new Cricut Explore Air! other times, I use sketches such as Mojo Monday or different challenges. but usually I go from start to finish in the same session. as soon as I can decide how to finish it. but in the excitement of creating, I often get sloppy. Mike and Jo know me quite well. but I wish there were some, though. I do go online quite a bit, but I try not to spend too much. Are you an impulse craft supplies shopper? Unfortunately, I am. A Cutterpillar and tons of stamps and coordinating dies. Do you have a blog? Yes. Clean up as you go … but that is advice I don’t usually follow. Do you have any inspirational words to share? I know. I know. What happens at the retreat stays at the retreat. Let's break a few rules. Tell me something interesting that was said or happened on your retreat. One of my roommakes had a small bottle on her nightstand. and I was positive that it was a bottle of hooch. 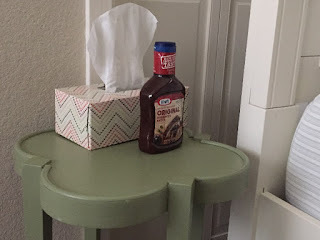 The next morning, I found out that it was a bottle of BBQ sauce! Thank you, Dodie, for sharing with us. I know the majority of her answers are new to you, but to me they are not. You see, I am the sister she refers to. Remember one thing: YOU matter. See you next time!